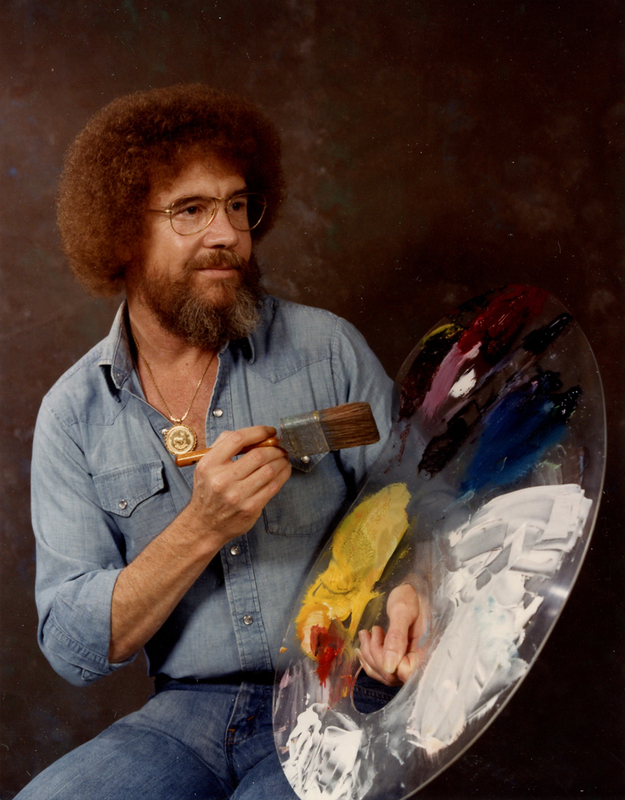 The Real Bob Ross: Meet The Meticulous Artist Behind Those Happy Trees Don't be fooled by his mild PBS persona; the beloved painter was actually an exacting artist and businessman with — brace yourself — naturally straight hair. "He got this bright idea that he could save money on haircuts. So he let his hair grow, he got a perm, and decided he would never need a haircut again," Kowalski explains. Before he could change it back, though, the perm became his company's logo — Ross hated it. 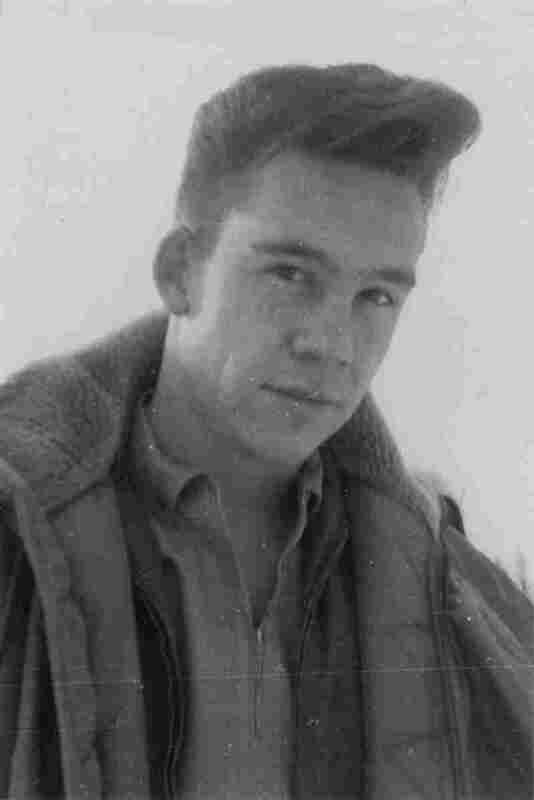 "He could never, ever, ever change his hair, and he was so mad about that," Kowalski says. "He got tired of that curly hair." But viewers never got tired of Ross or his show, The Joy of Painting. With his soft, hypnotic voice, he'd bring his viewers in close as he created 30-minute masterpieces — distant mountain ranges, seascapes, forest scenes, always with those happy little trees. He'd sling his palette around, blend the titanium white paint, whisper about his life in Alaska, then gently tap his fan brush to create a canvas full of fluffy clouds. With his partly unbuttoned chambray shirt, his halo of tight curls and his soothing demeanor, Ross was a fixture on PBS. Re-watching the show decades later — it's now streaming on Netflix — The Joy of Painting still feels like a personal art lesson. And yet the oil painter we spent so many hours with remains a mystery. Ross led a private life and did only a few interviews during his career. So, if you want to get to know Bob Ross, you have to seek out Kowalski. When she discovered Ross 35 years ago, she was in the aftermath of a family tragedy. "My oldest son was killed in a traffic accident. It was very difficult," Kowalski says. "I was so devastated. All I could do was lay on the couch and watch television." In the 1980s and 1990s, Ross was a fixture on PBS. The Joy of Painting invited viewers to watch over Ross' shoulder as he created small masterpieces in under 30 minutes. She watched a painter named Bill Alexander, who was big on PBS back then. Kowalski's husband was desperate to get her out of the house, so he signed her up for Alexander's painting class, 900 miles away in Clearwater, Fla. But then Alexander stopped teaching and passed his classes off to an unknown protege. "I was very disappointed," Kowalski says. "I so wanted to paint with Bill Alexander. But my husband said, 'Get up. Get in the car. We're going.' "
It was a five-day class in a hotel conference room. At the easel upfront was a guy with a perm who went by Bob. His paintings were good, but when he started talking to the class, that's when Kowalski knew she had met someone special. "I was so mesmerized by Bob," Kowalski says. "Somehow, he lifted me up out of that depression. I just think that Bob knew how to woo people. I said, 'Let's put it in a bottle and sell it.' "
They eventually filmed a commercial and launched a TV show, and it was on TV that Ross hit it big. In the first Joy of Painting episode, he's already using those friendly Bob-isms that made him famous: "Let's have a happy little tree right in here," he says. "There he goes." 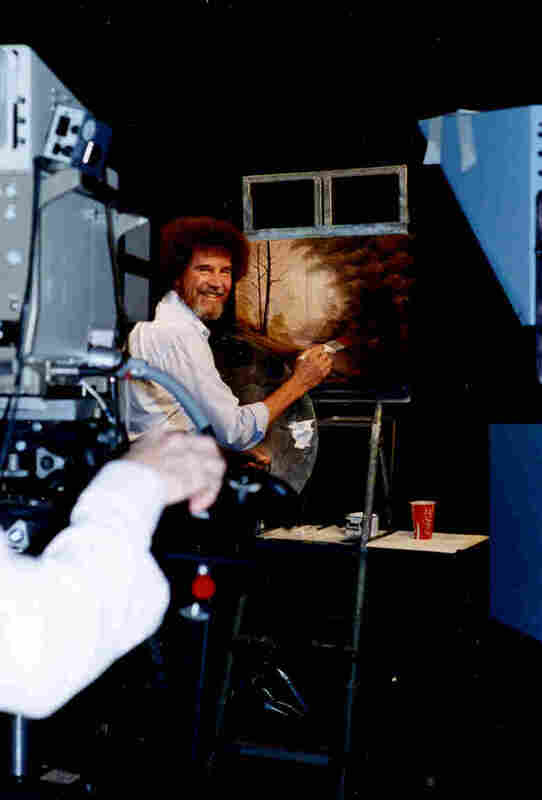 From 1982 through 1994, Ross filmed more than 400 episodes of The Joy of Painting. But most viewers weren't tuning in to paint alongside him. They were watching Bob Ross just to ... watch Bob Ross. "Shoot; we have a pretty nice lookin' little sky," Ross would say as he stood back to assess his work. "And there wasn't anything to it." He's making you think it's so easy. Well, let me tell you something — these [paintings] are not as spontaneous as they look. Then, unveiling his "almighty" 2-inch brush he'd say, "Now then — let's get crazy." "He's making you think it's so easy," Kowalski says. "Well, let me tell you something — these are not as spontaneous as they look." In fact, Ross made three of the same paintings for every episode. The first was sitting off camera and was used for reference. The second was the one viewers saw on TV. And the third was a more detailed landscape used for his instructional books. Ross was meticulous. Ross filmed more than 400 episodes of The Joy of Painting. He actually painted three different versions of each work for every show — but viewers only saw one on-screen. Ross made viewers in living rooms across the country believe that they could pick up a paintbrush and whip up some majestic snow-covered mountains. On TV he appeared so relaxed. But Kowalski has a different way to describe the real-life Ross: "A tyrant." "You don't believe that?" she asks. "Do you really think this company would be as successful as it is, if he didn't insist that everything be done a certain way?" After all, they had a company to look after, and Ross was as much a businessman as he was a painter. "I don't want to leave the impression that he was rude or nasty," she says. "He just wanted things done his way. He was wonderful. He was really wonderful. I want Bob back." Ross was diagnosed with lymphoma, and as his last days approached, he would sit beside Kowalski outside the hospital on a bench overlooking a lake. "He was wonderful. He was really wonderful," says Annette Kowalski, Ross' longtime business partner. "I want Bob back." "Bob was not always full of compliments, but he said to me, 'Annette, you are the wind beneath my wings.' And that is what I'm left with and it means so much to me," Kowalski says. Ross was 52 years old when he died on July 4, 1995. The company was left in the hands of Annette and Walter Kowalski, and Bob Ross Inc. remains an art supply giant. 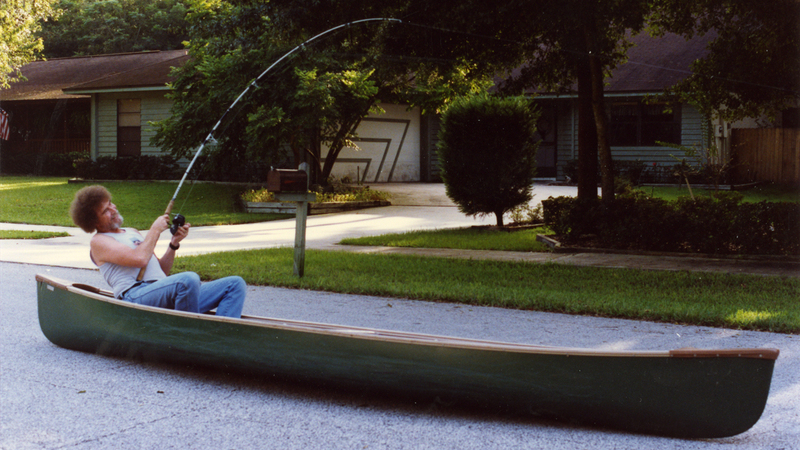 It includes paint and brush manufacturers, certified Bob Ross instructors, and now a deal with Netflix. "I think I'm doing this just the way Bob would've wanted it done," Kowalski says. "I'm very proud of the fact, and I think Bob would be happy if he could see it now."